Imprint: Bureau of Engraving & Printing; Treasy. Dept. Date Issued: Nov. 23, 1901. 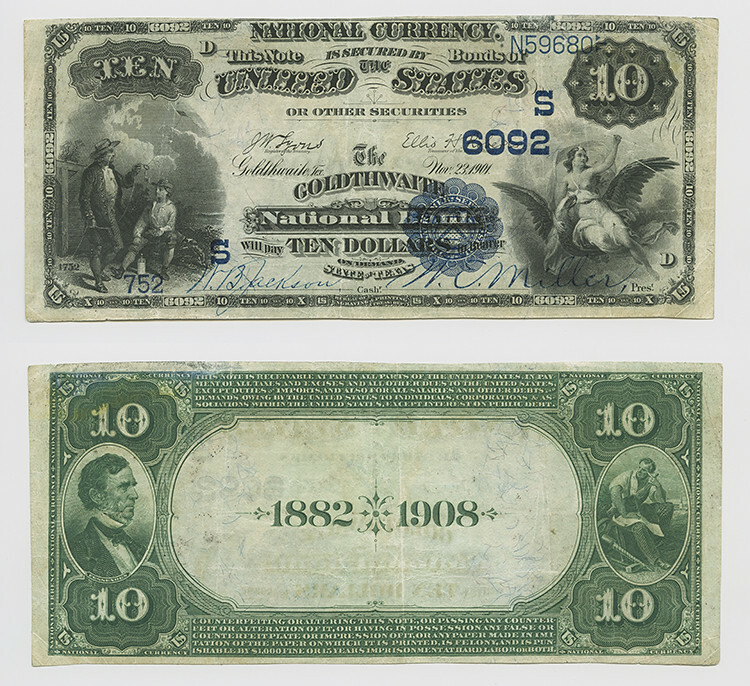 Notes: This $10.00 National Bank Note was issued in Goldthwaite in 1901 by The Goldthwaite National Bank. Bank serial number: 752. Treasury serial number: N59680. Signatures: J W. Lyons Register of the Treasury. ; Ellis H. Roberts Treasurer of the United States. ; W. B. Jackson Cashr. ; W. E. Miller Prest. Rights: Please cite DeGolyer Library, Southern Methodist University when using this file. For more information, contact degolyer@smu.edu.